Interplay's hit shooter is returning to PCs and consoles ten years after it was first released. 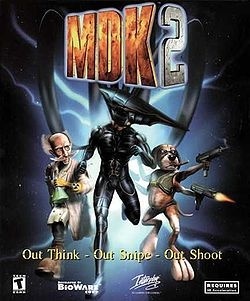 Remember MDK2? That really fun shooter developed by a fledgling developer known as BioWare and released by Interplay? You know, that game where you played as a janitor with a sniper rifle, a six-armed dog, and a bat$#!+ crazy mad scientist? Well, guess what? It's coming to the Wii and PCs in HD. Late last week, Interplay announced that the game was being revamped for a winter release on WiiWare, while MDK2 HD will arrive on PCs at an unspecified date afterwards. No development studio has been named to handle the game's revamp. That said, the game will be sold for the PC by Beamdog (a digital distribution service), but the distributor will apparently have some involvement with the re-release's development. "MDK2 was a great title to work on and we're happy to have some of the original team working on these new versions" said Trent Oster, co-founder of Beamdog, when the game was announced. It should be noted that Oster was a co-founder of BioWare, too, and MDK2 was one of the first games that BioWare developed. Interplay's re-emergence after its near-death experience in 2005 has been a slow affair, but the publisher's strategy seems to be relying on a lot of nostalgia and goodwill from older gamers. It's not a bad idea, but it seems a bit risky: Aside from Fallout and Baldur's Gate, there aren't too many household names in the publisher's catalog. That said, I certainly have some fond memories of playing MDK2 when I should have been doing homework, so I can't say that I'm not looking forward to this hi-def re-release. If you're curious about MDK2 or its predecessor, you can pick the original versions up on Steam (thanks The_root_of_all_evil! ).